When will our mechanical men (and women) reproduce the dulcet tones of the human voice? I don't know about you, but I'm getting tired of those mechanical voices. Fortunately, a polymer gel developed at Harvard and MIT successfully mimics the viscoelastic properties of human vocal cords. 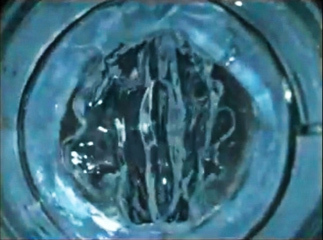 The polymer, PEG30, which is a modified form of polyethylene glycol (PEG), was shown to vibrate with a similar frequency to human vocal cords when air was blown through a vocal-fold model made of the polymer. Just to be clear, PEG30 is being developed as an injectable solution for use inside human beings; the polymer has been shown to restore vibration to the living human vocal chords that have become stiff and unable to vibrate due to scarring. But I think that the same solution might be used to help robots and artificial intelligences speak more clearly to us.